Chick-fil-A has been forced to defend itself after a New Jersey college revealed that the restaurant would not be welcome on the campus over its biblical stance on LGBT issues. In a diplomatic statement to CBS News, a spokesperson for the restaurant expressed the company’s sentiments on being excluded from choices at Rider University. Rider later followed up with a release explaining their position. Rider University isn’t the only educational institution turning its nose up at the restaurant. In October, Pittsburgh, Pennsylvania’s school board barred district employees and its schools from officially participating in a kids’ run sponsored by Chick-fil-A. In June, Twitter CEO Jack Dorsey was castigated for simply admitting that he was eating at the restaurant. Despite all of this, however, Chick-fil-A remains steadfast in its commitment to better communities around the U.S. In 2016, a massive Sunday power outage struck the Hartsfield-Jackson Atlanta International Airport and the restaurant — which is traditionally closed on Sundays — worked tirelessly to feed hungry travelers. After 2016’s Pulse nightclub massacre, the restaurant opened on a Sunday once more and handed out free food to thousands of people who had queued up to donate blood to victims. Texas saw the chain eatery at its best in 2016, when the restaurant opened yet again on a Sunday to prepare food for first responders and disaster response teams attending to a series of deadly tornadoes. As vegetarian I have never eaten at a Chick-Fil-A, but one thing has become clear. All the people whining and complaining about the personal beliefs of the owners of Chick-Fil-A are no more than virtue signaling jerks. 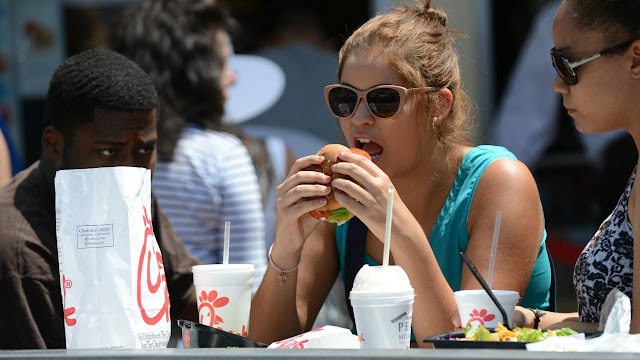 As I say, I am a vegetarian, but if I ever decide to start eating chicken, Chick-Fil-A is the first place I will go, just to thumb my nose at the self righteous yahoos of the SJW crowd.